Figure 1. 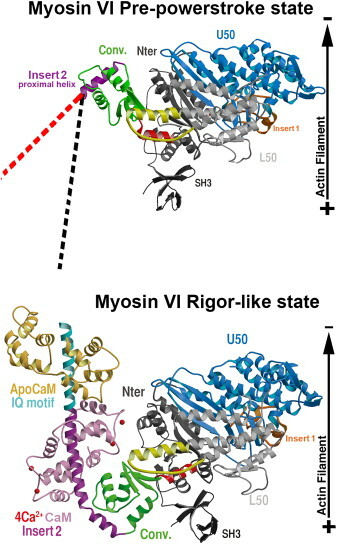 The Swinging Lever Arm Hypothesis and the Problem Posed by Myosin VI(A) The top panel illustrates the powerstroke of a (+) end-directed myosin, based on structures of scallop myosin II. From the pre-powerstroke (PPS) and rigor structures, a stroke of 7 nm is predicted for a construct truncated after one light chain/calmodulin-binding site (IQ motif). This corresponds to what has been measured for a truncated myosin V construct with one IQ motif. Note that if the lever arm were made longer, as in the case of myosin V, the measured powerstroke (stroke size) would increase . (B) This hypothetical model of the myosin VI powerstroke was generated using the same converter rotation and conformation for myosin VI as that found for plus-end motors, while maintaining the interactions found in rigor between the myosin VI converter and insert 2. Note that the lever arm is predicted to be oriented toward the actin filament, and a stroke of only 2.5 nm is predicted. (C) To generate the 11–12 nm measured stroke size for myosin VI, the orientation of the converter in the pre-powerstroke state must greatly differ from that of plus-end motors. Note in particular how the orientation of the proximal helix of insert 2 (white cylinder with purple contours) differs from the predicted model (B). Figure 2. 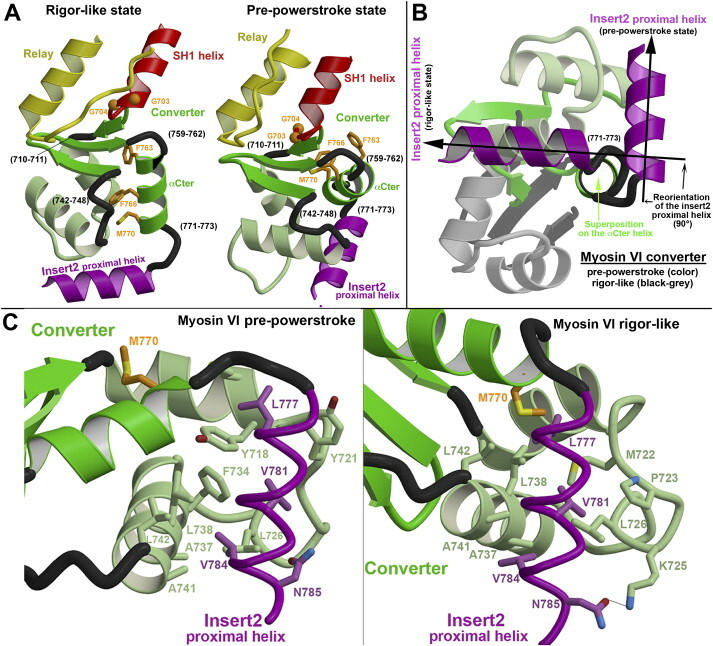 The Myosin VI Pre-Powerstroke Structure Reveals that a Converter Rearrangement Increases the Size of the Powerstroke. The structure of the myosin VI motor domain prior to force generation (pre-powerstroke [PPS]) is compared to that at the end of the powerstroke (rigor-like state). Note the drastic change in the converter (green) position and in the insert 2 proximal helix (purple) orientation. Possible positions of the full lever arm in the pre-powerstroke state are indicated by the red and black dotted lines. The black dotted line indicates that the kink observed in the insert 2 helix in the rigor-like state (below) is maintained in the pre-powerstroke state. The red dotted line indicates the lever arm position if there is no kink in the insert 2 helix in the pre-powerstroke state. This introduces approximately a 40° uncertainty in the lever arm position in the pre-powerstroke state. Figure 3. 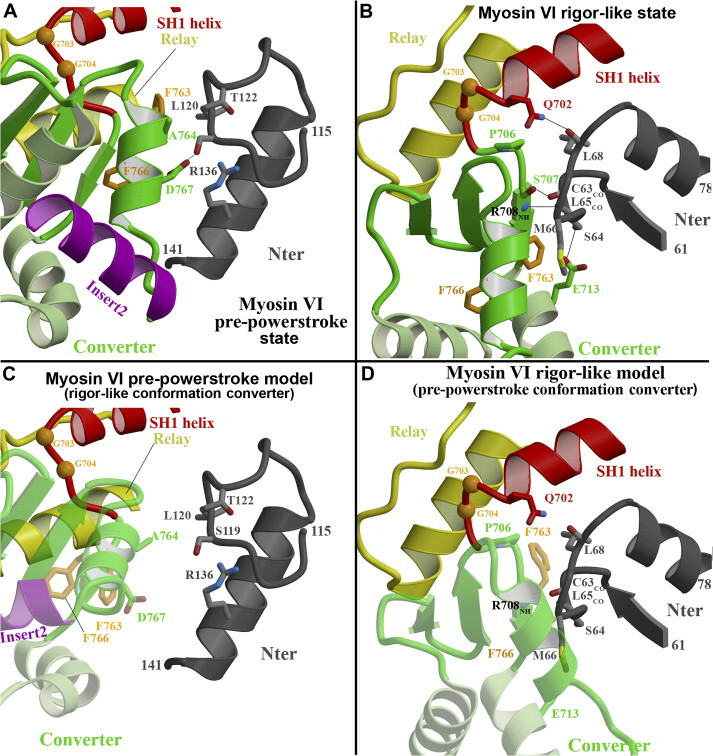 The Myosin VI Converter Is Less “Primed” in the Pre-Powerstroke State(A) The pre-powerstroke state of myosin VI (color) is compared to that of Dictyostelium myosin II (black), with the Lower 50 kDa subdomains superimposed. The structures are oriented relative to a horizontal actin filament (black arrow). Note the difference in the relay (yellow) conformation, which is less bent in myosin VI. This results in a 10° difference in the orientation of the converter (green for myosin VI with L753 indicated as a green ball, the equivalent residue I741 in Dictyostelium is indicated as a black ball). Thus, the converter of myosin VI is less “primed” than that of plus-end motors. (B) Sequence differences at three critical locations in the relay result in the reduction in the myosin converter rotation. 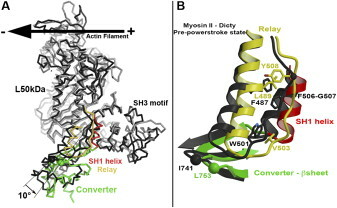 Less bulky side chains are found at the beginning of the relay near the helix bend (L489 in myosin VI, F484 in myosin II) and at the relay tip (V503 in myosin VI, W501 in myosin II). Also a one-residue deletion is found at the end of the relay (Y508 in myosin VI, F506-G507 in myosin II). All of these sequence differences contribute to diminishing the steric clash between the relay and the SH1 helix in myosin VI. Thus the relay is not forced to bend as much in myosin VI and the relay main chain is found closer to the SH1 helix than in myosin II. Figure 4. A New Conformation of the Converter Reorients Insert 2 in the Pre-Powerstroke State(A) The rigor conformation of the converter (left) is compared to that of the pre-powerstroke state (right). In the two structures, the beta sheet is found in a similar orientation and the interactions with the relay and the SH1 helix are mostly conserved. In contrast, four hinges (black) drastically change conformation and reorient the helices of the converter as well as the insert 2 proximal helix (purple). The helix-loop-helix motif (light green) found between the first and the second hinges moves as a rigid body. Note in particular how a drastic conformational change in the third hinge reorients the last helix of the converter (αCter). Three hydrophobic side chains (orange) buried within the converter in the rigor conformation are repositioned toward the surface of the molecule in the pre-powerstroke state. Note also that the SH1 helix unwinds at its C terminus (Gly703-Gly704) in the pre-powerstroke state (shown as orange balls). (B) An important change in the conformation of the last hinge (residues 771–773) allow the orientation of the proximal helix of insert 2 to differ by ∼90° (relative to the αCter helix) between the pre-powerstroke state (color) and the rigor state (gray). (C) Comparison of the docking site of the insert 2 proximal helix (purple) in the two converter conformations. The same surface of this helix (L777-V780-V784-N785) interacts very differently in the two structures, mainly with the helix-loop-helix motif (light green) of the converter. Figure 6. Converter/N-terminal Subdomain InteractionsThe position of the converter may also be influenced by the interactions it makes with the N-terminal subdomain. These interactions are weak in the case of the pre-powerstroke structure (A) but they are quite important in the rigor state (B). Note that the surface of the N-terminal subdomain involved in each case is different. Since the converter/relay interface is similar in both structures, it is possible to model the rigor converter conformation in the pre-powerstroke state (C) and the pre-powerstroke converter conformation in the rigor structure (D). It is clear that the rigor converter conformation is compatible with the pre-powerstroke structure but would not allow any interactions to be made with the N-terminal subdomain (C). In contrast, the pre-powerstroke conformation is incompatible with the rigor structure since a large steric clash would occur between the converter and the N-terminal subdomain (D). Thus, it seems that the unusual pre-powerstroke folding of the converter would be favored by myosin VI in the absence of constraints. Rearrangement to create the rigor folding, which is the one most similar to that of plus-end motors, may be triggered near the end of the working stroke by converter/N-terminal subdomain interactions.